It’s a beautiful thing to fly into Logan International Airport in Boston. No matter which direction you come from, the plane will eventually angle over the water of Boston Harbor, ceding views of the islands, the city, and the neighborhoods nestled into the low hills near the sea. Something else you might see are these curious eggs, arranged in what looks like a semi-industrial sculpture on an island just beyond the runway. They are the result of an environmental and economic success story – one in which an environmental disgrace actually figured into a presidential election. The Sunday after this year’s election, we were invited by friends to see their beach house in Winthrop, a modest coastal town just beyond Logan. It is one of the last Massachusetts working class towns on the beach, with cottages crowded cheek by jowl on tiny lots festooned with funky buoy art, lobster traps, and painted Adirondack chairs. As we strolled the sand, beachcombing for shells and picking up bits of stray garbage, planes flew in low overhead for landing. At the end of the beach, we walked onto an island that rose up with views of the Boston skyline on one side and the open ocean on the other. It was landscaped at the bottom with pretty parks with benches and trees and in the middle a berm rose up with native grasses like those that populate the marshes along Boston’s North Shore. The berm concealed the island’s true purpose as the site of the wastewater treatment plant that was constructed to clean up Boston Harbor. And those are the eggs, which are digesters of eastern Massachusetts raw sewage that used to be dumped straight into the water. The eggs are an engineering feat and the result of eventual political and judiciary displays of will, but they came about after centuries of avoiding the obvious. The problem of dumping raw sewage into a relatively closed harbor was first recognized in 1634 yet somehow ignored for centuries, until its solution was driven only by court order. By then, it had become Boston’s embarrassment, used by Republican presidential nominee George H. W. Bush against his Democratic opponent, Massachusetts governor Michael Dukakis, in the 1988 campaign. The eggs have cleaned up the harbor, and island is the pride of the beach neighborhood residents, who can walk the 2.5 mile circumference trail on a beautiful day. My neighbors, who voted for the current President-elect, loved to show it off and to tell me the biological details of how the digesters work. During this year’s presidential campaign, both candidates promised significant investment in infrastructure, but neither mentioned any projects that might begin to tackle the enormous environmental hard stops we are coming up against. This country has a lot of resources, know-how, and creativity in engineering, finance, technology, and good old-fashioned labor. I’d love to see every city identify and apply for funds or raise bonds to tackle the latest obvious problem, engaging their eggheads, their wonks, their working class to get it done – just as Boston eventually did, albeit under duress. Everybody knows what they are. The trashy, stinking river. The wetlands to be restored that would filter drinking water or hold a storm surge. The plastics pouring out of our landfills and into the ocean. The mountains of electronic trash. Or even, as the storied track coach would say, just start by getting the lead out. Since I last wrote, the yard came back to life. We didn’t have an entirely barren rectangle to start and so various plants reappeared, including weeds wherever they could. I planted the vegetable garden, pulled the weeds, composted and mulched, set up the sprinkler to water. We’ve mowed the grass that’s there, trimmed some bushes. I spent the spring months noticing the basic composition of the yard and how I might anchor it to begin the transformation to lush oasis. The space divides essentially into three triangles, from the deeply shady and barren slope on the left, to the middle where there is mostly grass and a fair amount of sun, to the much sunnier right side that is close to the vegetable garden. I also considered all the functions I wanted: A tranquil setting for our patio; somewhere to play with our dogs; habitat, hatchery, and corridor for mammals, birds, bees, butterflies, and other life; and a place to grow food and flowers for us to enjoy. On a trip to Vermont, when I saw this book, The Nourishing Homestead, I was inspired to think about how to get the most out of every square inch of our small patch in town. Ambitious, right? Not really — if you give Nature an inch she will take a mile. We know this is true when battling weeds. But when we introduce just a few new biotic aspects, it is really incredible the variety of life they attract, and how quickly. I knew I wanted smaller trees interspersed through the body of the yard, but I also didn’t want “ornamental.” I wanted functional, to serve all the purposes above. I was inspired by a Martha Stewart Living magazine to try dwarf fruit trees – I didn’t know that apricots and plums would grow in Massachusetts! Hooray! I had already planted a serviceberry – a wild version of a crabapple – that would host butterfly caterpillars in its bark. We bought the two fruit trees – $45 each – from a local nursery, and planted them as two points at either end of the line shared by the sunny triangle and the middle triangle. We moved the serviceberry upslope and to the left, to make the third triangle point. Next I’ll work on rhododendrons and/or mountain laurel to fill in the understory in the shady dry slope section. My hope is that these trees and bushes will serve as the infrastructure to anchor the design of the space, attract more biota, and begin to offer shade and shelter to us all. The American backyard is generally a fenced-in and mown space of grass. Any trees or plants stand along the edges, based with mulch in an attempt at clean perfection. But designs for clean perfection are static, and often devoid of life – they miss the chance to reference and nurture the greater environment. They require artificial aids to maintain, because nature works against squared off, scrubbed portions of the outdoors. Lawns are lovely, for sure. Though our “lawn” is about a third crabgrass and violets, it’s a sweet expanse of green when it’s just been mowed. I imagine lying on it, on a blanket, on some Saturday afternoon when I commit to relaxing in my backyard with a book. But it dries out easily. Weeds spring up. It’s not very interesting. The basic rectangular views leave no mystery – no secrets or surprises. We have a panoramic view of this yard out our kitchen windows. What we mostly see is the back fence. Our yards are part of a much bigger landscape, even if we work to keep them as barren nicks in the canopy. Where I live, the original landscape is composed of forests, meadows, wetlands, and ponds. A few miles east of me, salt marshes signal the transition from land to sea. Wildlife travel across and thrive within these landscapes where they can, though humans disrupt their habitat and corridors not only with concrete but also with mulched and pesticided perfection. It doesn’t take much to turn your small piece of the rock into an oasis of flora, a connector and resting place for the fauna that belong where you live, and something much more soulful to enjoy. When planted with depth, yards become more visually intriguing and sensually pleasant. Rather than decorating the edges with the usual plant fare at Home Depot – plus mulch – consider disrupting the rectangle, even when it’s fenced in. You can start small, as we’re planning to in our yard this year. I’d like to plant a few smaller trees throughout the interior, trees that might naturally succeed in a sun-drenched forest clearing and would look pretty out the window in the winter. I discovered that two such natives in my state are black birch and serviceberry. I also learned that the right trees would support not only birds and other usual arboreal customers, but would also provide hatcheries, in their bark, for butterflies and moths. Start with one change this year – a single tree in the center, three or four native shrubs to one side, or an area of native grasses and perennials in your own private hummingbird and butterfly meadow. Take down a side of fence and plant a natural barrier of native shrubs that will thrive in that spot, with a native ground cover, rather than mulch, to spread beneath them. Then sit outside, or look out the window, and start documenting the new life that you see – the birds that visit, butterflies, bees – it’s addicting once you get started. Here is our yard at its bleakest: After the winter, before the spring. 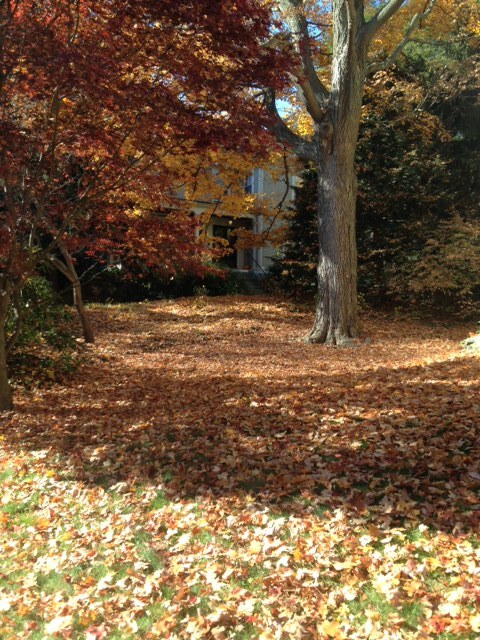 Soon the leaves will be cleaned up — they were left deliberately to mulch the lawn. The bushes and trees will leaf out, and the rhododendrons, azaleas, and forsythia will bloom. Birds will sing, and bunnies will continue to bound out of our leaf pile. It’s a sure sign we got our piece of the rock. So why is it so… square? If you give Nature an inch, she will take a mile: In the corner of our yard, shared with our neighbor, stands a five story tall hemlock. Its lower branches spread above our sprawling leaf pile. While I took the dogs out yesterday I heard a tap tap tap that made me look up, and I saw a small woodpecker making its way around one of those limbs. Closer to me, several chickadees trolled for seeds, their gray and white, black-capped bodies hopping around just above my head. Two blue jays flew out of the middle. We’ve seen red tailed hawks regularly landing at the very top, many other birds at the mid-section, and rabbits, possums, squirrels of course, and a fox beneath it.Just looking up brought busy and multi-colored life into view, all around one tall tree. In our internet-driven world, we are bombarded with petitions and memes, but can’t always easily find accurate information about the issues of the day. Like that factoid about our brains, web design seems to use only about ten percent of its potential to inform and engage. Many major environmental problems – like global warming, acid rain, or the hole in the ozone layer – could be explained with simple and friendly interactive media. Yet most environmental groups’ websites present the facts in pages of text and a forceful, “the science is settled” tone. You’d have to be pretty committed to wade through it, and likely already convinced. This allows skepticism to fester. In the case of global warming, the impression has grown that scientists have reached a foregone conclusion about human activity and so have missed other causes. The rest of us aren’t given a clear sense of how to answer those claims, which makes us hesitant to engage with someone who isn’t convinced. Scientists have approached the question of global warming for decades, and through that process asked themselves all the questions people ask today: Is it natural? Is from it sunspots? Is it from water vapor? They’re not stupid questions: They’ve been asked and answered by some of the smartest people in the world. You wouldn’t know that now from the discourse, and yet presenting that process would help bring some people along. I was once part of a team invited in to a prominent Republican U.S. Senate office, from a state that is being pretty drastically affected by climate change already, to present the science on global warming. We counseled the lead scientist to start with these questions in his presentation, to acknowledge that they are the right ones to ask and to convey that conclusions about global warming were reached only after extensive investigation. He did not. He instead gave a forty-five minute rambling presentation about global warming from the perspective of settled science. The first question from a Senate staffer was, “What about sun spots?” By then, the scientist had lost his audience, turned the conversation unnecessarily antagonistic, and hadn’t brought anyone together to look at what was really happening to our world and what we might be able to do about it. A journalist friend of mine, Eric Roston, who is the sustainability editor at Bloomberg, tackled these questions in this beautifully and simply designed interactive graphic, which you can find here. The design is one of clarity, humility and unity in addressing the questions we all have. And you can share it, online, with your friends – believers and skeptics alike. photo credit: NationalGeographic.com. 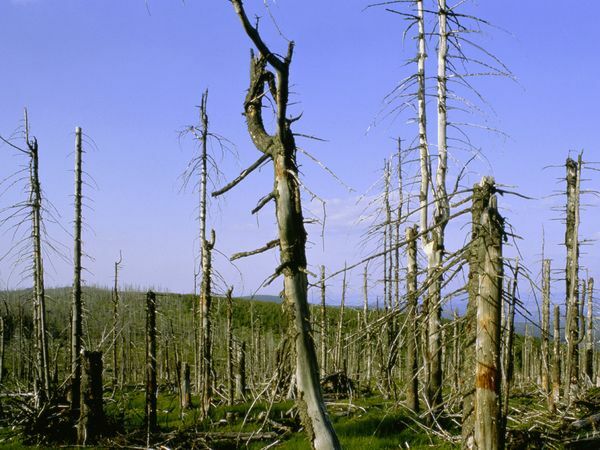 Dead spruce from acid rain.